This week I was busy designing a research activity for middle-schoolers to research and marvel at the omnipresence of the Fibonacci sequence in nature; how uncommon it is to find flowers with 10 petals, for example, and only very rare with four. It was a small moment of pleasure that put a smile on my face when the Fibonacci numbers crept in my thoughts while I was decorating the cake. Check out the number of lemon petals. 🙂 A great opportunity to get my daughter to predict how many lemon petals should be on the cake. 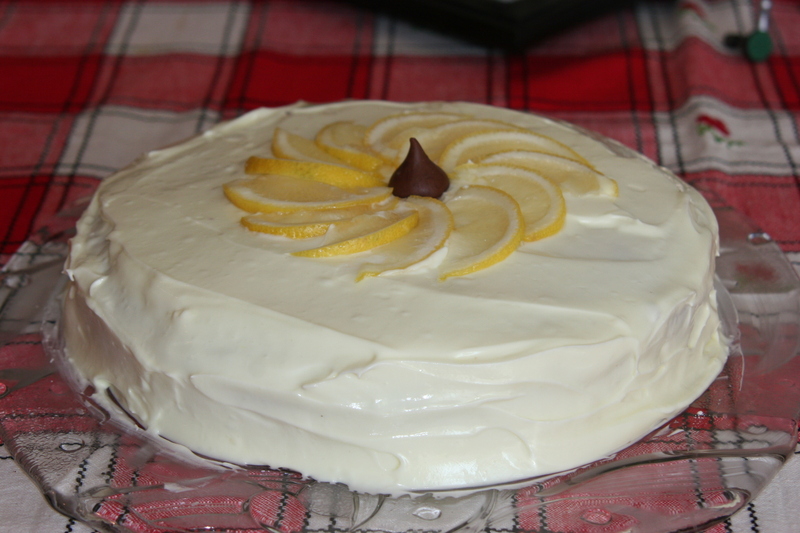 The basic recipe for the lemon cake is Vicky’s lemon bread recipe that I posted a while ago. In this one I changed the recipe for the frosting once more and I’m very pleased I did. I wanted the frosting to be creamier and fluffier than before. I loved the fluffier version and the kids licked the bowl clean. How to make: Wash the lemons well. Keeping the skin on, cut them in 8 pieces and remove the seeds. Use a food processor to chop the lemons. Set aside. In a mixer, beat the butter with the sugar, then the eggs, until you get a nice thick cream. No less than 5 minutes. Add the chopped lemon, beat a bit more. Finally, add the flour and the baking powder (or just self-rising flour). Beat a bit more and you’re done. Pour the batter in a buttered baking pan and cook in pre-heated 360F/180C oven for about an hour or until a toothpick comes out clean. This time I used a silicone round pan because I wanted to present it more as cake rather than bread. To make the fluffy frosting, beat the cream cheese (at room temperature) with the confectioner’s sugar and lemon juice until nice and smooth. Gradually add the milk and the envelope of instant lemon or vanilla pudding. You can stop adding when you get the consistency you need. Cover the cake with the icing and decorate. My decorated is simple. A Hershey’s kiss in the middle and very thin slices of lemon. If you have the energy (I didn’t), remove the lemon from the slices and use just the peel. You’ll need more slices but it’ll look very nice. Notes and tips: To make this cake richer in fiber, I added two tablespoons of ground flax seed. It gives the dough brown dots as when you add ground walnuts or other nuts but the taste remains great and you get much more than the fiber bonus. Flax seed contains only oil (mostly omega-3), proteins, and fiber. All good. I really liked the lemon cake! I LOOOOOOOOOOOOOOOVVVVVVVVEEEEDDDD the lemon cake. P.S. How many recipes do you have on your blog? Love you! I’m glad you liked it. It was pretty good. I like it, too. Not sure how many different recipes are on my blog. To date I’ve made 242 posts but not all of them are recipes and some recipes I posted couple of times with minor variations. I estimate there must be about a little less than 200 recipes. It surprises me now that I’m thinking about it. Does it feel like you’ve tasted 200 recipes in a little more than a year?! Amazing.